Capt. Warren Broadbridge spent Tuesday afternoon, Sept. 24, 1872, supervising the loading of 272,000 feet of lumber. He also had a wary eye on the sky while his boat, the propeller Galena, lay moored at Alpena, Michigan. Even when he brought the vessel into port earlier that day the weather was unsettled and threatening. By late in the afternoon it was clear that a gale was building from the southwest. Broadbridge knew his planned trip to Chicago was going to be tough going. He was still watching the developing weather as passengers began boarding the boat that evening. Departure time was 11 p.m. so the five people booked for the trip didn't start arriving until after supper. Broadbridge made the decision that evening to sail on time, in spite of the gale. He told first officer William Walker that he knew the storm would give them trouble until they cleared North Point, but after that, the Galena would have the wind at its stern during the trip north to the Straits of Mackinac. The captain's remarks about North Point were prophetic. As the Galena steamed out of the harbor that evening, Broadbridge said he steered in what he thought was a wider than normal arch around the point and would be safely clear of it when he told his wheelsman to turn north. But Broadbridge didn't have the benefit of modern radar, the night was pitch black, and he had no way of knowing that the gale was blowing the boat farther off its course than it should have been. By midnight, the Galena was hard aground on the outer reef, about a mile and a half from shore. The vessel struck with a jolt, throwing crew and passengers from their bunks and rattling pans in the galley. Broadbridge ordered the engines reversed. His first hope was that the hull wasn't damaged and that was a chance to back free. The steamer wouldn't budge. Inspection revealed a large hole in the wooden hull near the bow. The seas were already pounding the Galena with such force, the boat was in danger of breaking up. Rather than fight the storm, Broadbridge ordered the ship scuttled. By filling the hold with water the vessel was stabilized. This helped prevent the seas from pounding it to pieces. Since the Galena was already hard aground, it sank only a few feet before settling with a slight list. The cargo of lumber creaked as it adjusted to the odd tilt of the deck. Thus began a period of anxious waiting for the estimated 20 souls trapped that night on the steamer. The storm continued throughout the night and raged all the next day. With the engine room flooded, there was no heat. Waves rolled over the decks, buffeting the cabins, and threatened to destroy the ship. The steamer Wenona passed the wreck on Wednesday morning, cautiously making its way against the gale as it entered Thunder Bay on a trip from Mackinaw City. The Wenona's skipper reported that he observed large waves breaking over the upper decks and cabins and he was afraid the steamer was breaking up. He said he could not get close enough to take survivors for fear of putting his own boat on the same reef. At about 2 p.m. the bark Erastus Corning, with Capt. George H. Clarke at the helm, saw the Galena as it was passing the point on its way down the coast on a trip toward Detroit. Clarke ordered the Corning's anchors dropped about two miles off the point. Then he sent four sailors in a yawl to attempt a rescue. The men reached the Galena after an hour of hard pulling. They were surprised to find the people aboard the wreck in relatively good spirits and the crew still hopeful that the storm would abate so that the ship could be saved. Nobody was willing to leave the Galena and take advantage of the Corning's offer of rescue. By nine o'clock that night, however, Broadbridge was having second thoughts. The storm did not ease at sundown, as he had hoped. If anything, it was showing signs of getting worse. He decided that if four sailors from the Corning could successfully bring a yawl across two miles of that violent lake to check out his crew's well-being, he could get a yawl across that mile and one-half stretch of water and reach the shore. 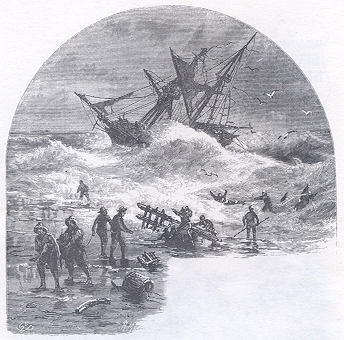 A boat was lowered on the lee side of the wreck, and a delegation consisting of Captain Broadbridge, clerk J. C. Gilchrist, second officer M. Cook, engineer E. Moshier, a wheelsman, a watchman and all five passengers made a perilous journey to shore. First officer Walker and a small number of crew members elected to remain with the boat. Broadbridge's craft arrived on shore about an hour later. Everybody was cold and wet. After getting to shore, they still had to walk several miles to Alpena, not arriving there until the next morning. By Thursday afternoon, the Galena was showing signs of breaking up and Broadbridge ordered his boat abandoned. He brought a boat back to the wreck and removed the rest of his crew. A story in the Detroit Daily Post said by the end of the week, as the gale continued to play havoc with the wreck, one of the arches was gone and it appeared as if the hull was broken. The wreck was never salvaged.